S. D. Goitein's magisterial five-volume work on Jewish communities in the medieval Mediterranean world offers an unparalleled view of how people lived, traveled, worshiped, and conducted their economic and social affairs. Living under Muslim rule, the Jews became increasingly urbanized and played a significant part in an expanding world economy. As major actors in the flourishing intellectual life of the period, they forged much of what constitutes traditional Judaism today and served as a conduit of Islamic learning to the Christian West. Goitein's masterpiece is now abridged and reworked by Jacob Lassner in a single volume that captures the essential narratives and contexts of the original. To understand the value of this distillation, we need to picture the remarkable, all-but-impenetrable cache of unique letters and documents found by accident in a geniza, or repository of sacred writings, in Old Cairo. These materials, unlike historical chronicles and literary texts of the time, represent the living experiences of people in a wide variety of settings throughout the entire Mediterranean and stretching as far east as the Indian subcontinent. Goitein explored and interpreted these texts as no other scholar had. Lassner, in turn, makes Goitein's findings available to a wide audience and then moves on to raise a host of new and tantalizing questions about the Jews of the Geniza and the relationship of their community to the hegemonic Muslim society. 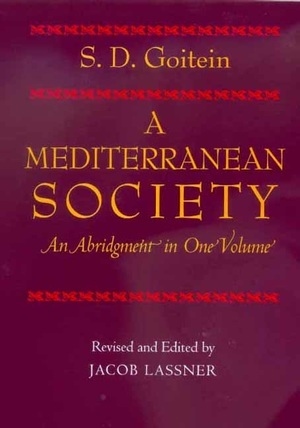 S. D. Goitein, who was associated with the Institute for Advanced Study at Princeton University at the time of his death in 1985, was honored with the Haskins Medal of the Medieval Society and the National Jewish Book Award for A Mediterranean Society. Teacher, administrator, and prolific writer, he was a preeminent scholar in the areas of Jewish-Arab relations and Islamic culture. Jacob Lassner, Philip M. & Ethel Klutznick Professor of Jewish Civilization at Northwestern University, is a leading authority on the medieval Near East.